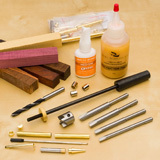 Getting started pen turning is most economical when you begin with a pen starter kit. 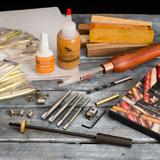 Starter kits have everything you need to make a wooden pen including the pen mandrel, pen drill bit, bushings, pen kits, turning tools and pen turning instructions. We offer starter kits for most several styles of pens at an affordable price without sacrificing quality or service.